Meditation has ancient, religious roots, but it has also become a secular practice, implemented to promote wellbeing and to treat depression and anxiety. Skeptics might be wary of this jump from spiritual origins to medical treatment, but mounting evidence suggests that meditation can have tangible effects on the brain. In a practice called mindfulness meditation, people concentrate on the present moment: on breathing, physical sensations, sounds, thoughts, and emotions. To brains accustomed to planning, predicting, story-telling, wondering, remembering, regretting, and worrying, fixating on the present is unusual and challenging. However, spending time thinking in this new way produces measurable changes in both the white and gray matter that make up the brain. Gray matter is the portion of the brain that is made up of nerve cell bodies, while white matter is made up of long and slender extensions of the cell bodies called “axons.” The cell bodies of the gray matter release chemical or electrical signals in response to the electrical impulses of the nervous system, while white matter forms connections between the cells, allowing communication between different brain regions. This communication between the gray and white matter in the brain is what constitutes thinking. Changes in both gray and white matter can be measured with different types of magnetic resonance imaging (MRI) (Figure 1), which detects differences in blood flow to brain regions by stimulating changes in the magnetic fields of iron atoms in the blood. Many studies have now been conducted using MRI to examine the effects of meditation on the brain. This research is starting to reveal how changes in the brains of meditators may translate into mental benefits. For example, after eight weeks of a mindfulness-based stress reduction class, participants exhibited increased gray matter in four regions of the brain: the left-hippocampus, the posterior cingulate cortex, the left temporoparietal junction, and the cerebellum (Figure 1) . These areas of the brain are involved in the regulation of emotion, compassion, coordination, learning, and memory. Tellingly, defects and decreased gray matter in the hippocampus and cerebellum (the opposite of what is seen in meditators) have been associated with post-traumatic stress disorder, anxiety, depression, and sleep disorders. 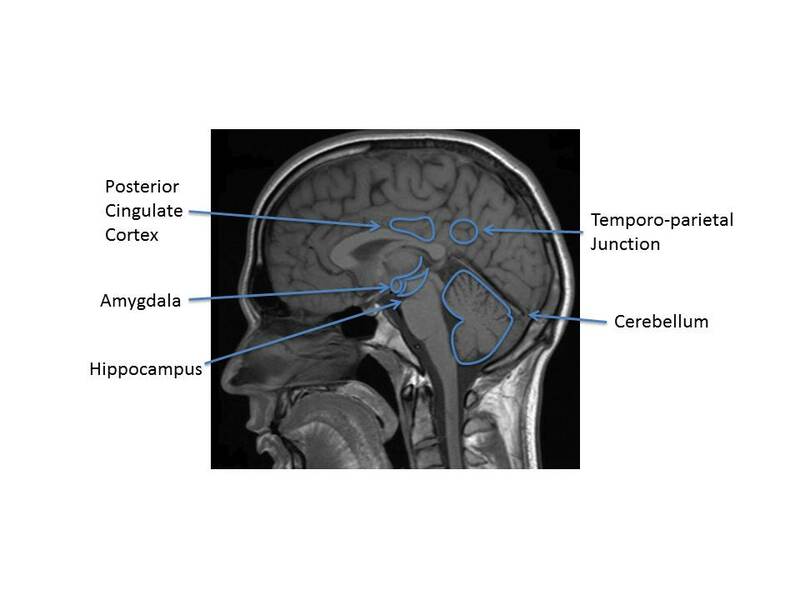 In addition, participants exhibited decreased gray matter in the amygdala—the region of the brain that controls the release of stress hormones (Figure 1) . So, in the hippocampus and cerebellum, more gray matter contributes to coordination, memory, and emotional regulation, while in the amygdala more gray matter contributes to stress. Meditators then, might be expected to have better emotional regulation and less stress compared to non-meditators. Indeed, these changes in gray matter over the eight-week period were not observed among control subjects who had no meditation experience before or during the study . The changes in gray matter observed in mindful meditators correspond to emotional and behavioral improvements, including decreased anxiety, decreased risk of depression relapse, decreased insomnia, and increased compassion (See “Interactive Multimedia”). Importantly, improvements in anxiety and depression among mindful meditators have been observed in many studies, indicating that at least some mental health benefits from meditation have strong scientific support . (Also see, “Changes in the Brain” multimedia). Figure 1. Profile of a human brain using an MRI. Regions outlined that change after eight weeks of mindfulness meditation training. Original image by Helmut Januschka, modified. Functional connectivity MRIs (fcMRIs) detect correlations in the changes of blood flow across the brain, and reflect white matter connectivity between different regions. They have also been used to examine the impact of mindfulness meditation. Using fcMRIs, experienced meditators in one study exhibited increased connectivity compared to non-meditators . Furthermore, another study using a type of MRI known as diffusion tensor imaging, which detects white matter fibers directly (Figure 2), revealed that meditators have an increased density of axons, increased integrity of the protein sheaths surrounding the axons, and increased efficiency of signal transmission through the axons . Researchers are still trying to figure out why increased connectivity results in some of the benefits of meditation. Figure 2. 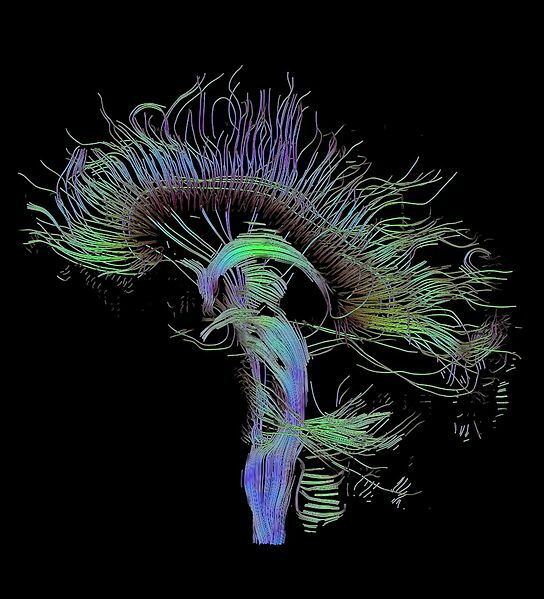 Profile of a human brain using diffusion tensor imaging, showing the white matter connections of the brain. Image by Thomas Schultz, http://www.sci.utah.edu/~gk/DTI-data/. Researchers conducting these studies wondered whether this increased connectivity in meditators actually translates into better communication between different regions of the brain and enhanced efficiency in switching attention from one sensation or thought to the next.. They investigated this by measuring alpha rhythms, the electrical signals or “brainwaves” that transmit sensory and motor information. They found that when asked to switch their focus of attention meditators exhibited alpha rhythms with greater amplitude than non-meditators, as measured by another MRI technique called magnetoencephalography. This increased amplitude is thought to indicate improved transmission of signals throughout the brain. Researchers hypothesize that this improved transmission may be responsible for the reductions in pain and negative thoughts reported by mindful meditators , as they may be better at changing focus from negative sensations or thoughts to positive or neutral stimuli . If so, this would explain why directing the focus of attention in meditation and improved connectivity leads to some of the observed mental benefits. The potential for mindfulness meditation and related practices to change people’s brains is a promising area of ongoing research. Replication of these brain-imaging studies in larger groups of people will be an important confirmation of results . Furthermore, basic research into the function of different brain regions and the significance of changes to brain matter density and connectivity will clarify how these changes to the brain impact people’s moods, behaviors, and bodies. For instance, the effects of meditation may go beyond the brain. Earlier research, described in “Calming Your Nerves and Your Heart Through Meditation” (http://sitn.hms.harvard.edu/flash/2009/issue61/) supports a reduction in heart disease among people practicing transcendental meditation—another form of meditation that involves the use of mantras. Other current research is investigating whether mindfulness meditation can improve learning  and boost the immune system . Such benefits may seem far-reaching for a simple thought exercise. However, these studies indicate that meditation may be like actual brain exercise, stimulating physical changes to neural fibers and having widespread ramifications for the body. Elizabeth Brown is a graduate student at Harvard University. 8. Black, Harvey (2012, November/December). Meditate That Cold Away. Scientific American Mind. 24:18.